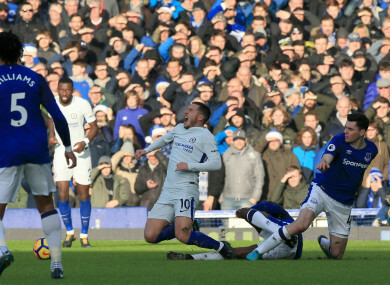 Chelsea's Eden Hazard (centre) reacts after a tackle during the Premier League match at Goodison Park. Email “Big Sam's rejuvenated Everton keep Chelsea at bay”. Feedback on “Big Sam's rejuvenated Everton keep Chelsea at bay”.